John Ford (February 1, 1894 – August 31, 1973) was a noted and highly accomplished American film director. Although most famous for westerns such as Stagecoach, My Darling Clementine, The Man Who Shot Liberty Valance, and The Searchers, he also made cavalry movies, some movies set in Ireland, such as The Informer, How Green Was My Valley, and The Quiet Man, some war movies such as The Long Voyage Home and They Were Expendable, some adaptations of such classic twentieth century American novels such as The Grapes of Wrath, among many other films. His four Academy Awards for Best Director (1935, 1940, 1941, 1952) are unmatched. Ford was a key figure in the creation of the iconic style of the classic Hollywood movie. His work helped to create the American mythology of the heroic individual. His framing of scenes and his blocking of actors in cinematic space and time were near-perfect. His eye for and resulting style in film-making have been tremendously influential, leading colleagues such as Ingmar Bergman and Orson Welles to name him one of the greatest directors of all time. When asked where he learned the craft of film-making, Welles famously replied, "The old masters, by which I mean John Ford, John Ford, and John Ford." Ford has influenced directors as diverse as Akira Kurosawa, Martin Scorsese, Steven Spielberg, Sam Peckinpah, Sergio Leone, Jean-Luc Godard, and many others. People who dislike the content of Ford's films often nevertheless admire his visual sense, his eye for composition and framing of scenes. During the 1920s, Ford served as president of the Motion Picture Directors Association, a forerunner to today's Directors Guild of America. His good friend Merian C. Cooper, the director of King Kong (1933), produced several of Ford's most admired films. The person who became John Ford was born Sean Aloysius Feeney (or "O'Feeny" or other spellings, as records vary) in Cape Elizabeth, Maine, to Sean (or John) Augustine Feeney and Barbara (Abbey) Curran, both of whom were born in Spiddal, County Galway, Ireland, in 1856. John A. Feeney's grandmother, Barbara Morris, was said to be a member of a local (impoverished) gentry family, the Morrises of Spiddal, headed at present by Lord Killanin. John Augustine and Barbara Feeney arrived in Boston, Massachusetts, and Portland, Maine, within a few days of each other in May and June 1872, were married in 1875, and became American citizens three years later. John A. owned several saloons in Portland, and thus the family was modestly prosperous. They had eleven children, among them were Francis (later Francis Ford), 1881-1953, and Sean Aloysius (later known as John Ford), 1894-1973. Many of John Ford's films contain direct and indirect references to his Irish and Gaelic heritage; those Irish-set films are his warmest and most sentimental. His family referred to him as Sean. Around 1900, Francis left Portland for New York and the theater. He became successful and took the name Francis Ford; he also broke contact with his family. Around 1909, he went to California and became part of the movie industry that was developing there. One afternoon around 1914, his mother saw a movie at the local theater and recognized her son Francis in it. As a result the father wrote to the movie production company asking to be put in touch with his son. Francis then returned home in triumph to Portland to visit his family. Through this, young Sean/John learned about the movie industry and realized he wanted to be part of it. John arrived in Los Angeles in July 1914. Francis had begun to make a name for himself as a director of westerns—these were silent films because sound film did not come along until more than a decade later. The younger brother took the name John Ford, and worked with his brother Francis as an assistant. Those were pre-union days when a willing and able person could do anything on a film set and learn as much as possible. At the time, there could be as many as forty companies employing a total of five thousand people working on the Universal lot. From 1914 to 1917, John did almost everything: Playing bit parts, doing stunts, working as a set builder and property man. He learned to work with horses, explosives, cameras, and everything involved in the technical side of making films. At the time, the big-name directors were Thomas Ince, Sidney Franklin, Allan Dwan, Tod Browning, and D.W. Griffith, the greatest of all. The young John Ford learned from all of them, especially Griffith, with whom he worked on several pictures. As an assistant director, Ford had to handle the extras and the cowboys, many of them mean, rough, stupid, and cruel people, most of them from Wild West shows. Jack Ford was a leader and he could handle men. He used his own language when he lined the cowboys up. There wasn't any "Please step over this way." It was "Come on, you bastards, get in line and shut up." He was only twenty years old but there was no doubt who the boss was. He was a natural director. He wouldn't just say to a bunch of cowboys, "Come over the hill and yell." He'd give them all specific pieces of business. He'd say, "You there, when you ride over the hill, throw your hat up in the air; you over there, get shot and fall, and you, I want you to get shot at the top of the hill but make it all the way down before you keel over." He'd pick those things out for himself. He wasn't directing principals, but he was directing. (Quoted in Eby, 125-126). In 1917, Ford wrote, acted in, and directed his first film, The Tornado, a two-reeler. He followed this immediately with another two-reeler, The Scrapper. Ford established a pattern of working quickly, making numerous films in one year; in 1917, he made eight films. In the years from 1917 to the end of 1923, Ford made at least forty-eight pictures. During this time he also teamed up with Harry Carey and ended up making at least twenty-three films with him. The lessons Ford learned during these years, with their fast pace and small budgets—many of these pictures were made up off the cuff, without a script, with the director and actors making the picture up as they went along—stayed with him throughout his life and career. He worked economically, shooting a minimum of takes and not repeating takes from different angles, with different line readings, and so on, as is customary with many directors. Ford did a minimum of set-ups, usually with stationary camera. He rarely used close-ups or a moving camera, but, consistently, his images are as graphically strong and powerful as those of anyone else, including those of Sergei Eisenstein; Eisenstein's images are, however, "cold," emotionally speaking, whereas Ford's are "warm." Henry Fonda remarked of Ford, "In many ways this man was a poet—a visual kind of poet … Ford had a picture eye." It was sometimes said that all the film editor had to do on a Ford picture was cut the slates off the beginning of each take and then put the takes together. In fact, some critics have faulted Ford for tending to being too fast and slipshod in his work. Ford also took pride in being commercially successful, in making movies that people wanted to see. Many of Ford's movies in the early days were put together by what was known as Ford's company, a close-knit group of actors and technicians, with actors subservient to him (he came to be known as "Pappy"), working in a remote location, often living together in one house, far away from studio heads and their interference. Ford and Carey would stay up late into the night, talking and making up the script for the next day, when they would then go out and shoot it. Universal Studio would sometimes hire a writer and send him out with Ford, but Ford and his group would usually reject what the writer had done as horrible and go back to doing things their way. Although later in his career Ford would work with prepared scripts, he almost always exercised script control and frequently would use only a part of the prepared script, simplifying it for his purposes. [About plans for Men Without Women] We decided on a submarine story. I told him I could write a play, not a script. In his humorous way he asked if I could write a play in fifty or sixty scenes. Sure. So I did it. It was never a script. The I went on the sets and watched him break it down into film scripts as he shot. I went to rushes, cutting rooms, etcetera and began to grasp what it was all about. But I must say I was baffled for many months by the instinctive way Ford could see everything through a camera—and I could not…. Working with Ford closely I fell in love with the cinema. What I found was an exciting new way to tell a story; new to me, old to Ford (Quoted in Eby, 127). On at least one important occasion, Ford introduced himself by saying, "My name's John Ford. I make westerns." Like a lot of things Ford said, this wasn't exactly true, as many of Ford's best films are not westerns. But it wasn't exactly false either because most of Ford's pictures were set in a time and place in American history when horses were the main means of transportation, the train and car were just entering the scene, and there was still a frontier to be conquered. Ford never made an urban film; today's films set in cities and exploring the ways of city life, as well as film noir, are utterly foreign to Ford's sensibility. Ford admired and reveled in the ethos and sensibility of what has come to be known as the western hero, but Ford presented those multi-dimensionally. His western heroes sometimes despised and flouted received authority, but they mostly did accept the higher authority of religion, family, and orderly tradition. Ford never celebrated the antihero—the thief, the criminal, the failure (although he came close to that with the Tom Doniphan figure in The Man Who Shot Liberty Valance). Ford's most enduring themes were those of individual duty and achievement, honor, and the "manly" virtues. He also emphasized family, piety, community, and patriotism. Ford was smart enough to recognize that those values and themes may clash with each other, and that they could even become irreconcilable. The community may be wrong, and the individual must sometimes resist it. Ford seems to have become more conscious of this later in his career, and even to have become something of a revisionist. In The Man Who Shot Liberty Valance (1962)—considered by some notable critics to be Ford's greatest film—the character Ransom Stoddard (played by Jimmy Stewart) resists against and rejects the community's acceptance of the principle of rule-by-gun. Yet ironically, Stoddard's ability to pursue a career based on law and even to become a U.S. senator is based on Tom Doniphan's (played by John Wayne) living outside the law and shooting the villain without qualm in such a way that Stoddard got credit for this deed. Liberty Valance may be the darkest of Ford's films, expressing most strongly Ford's critical examination of contradictions in America and American character: Tensions between individual and community standards, between civilization and pre-civilized rough natural life, and the preference for legend over facts. Cheyenne Autumn (1964; Ford's final western)—based on the 1838 Trail of Tears, in which the Cherokee Indian tribe endured a forced relocation to Indian Territory in Oklahoma, during which approximately 4,000 of the estimated 15,000 Indians died—further carried out some of the revisionist and critical stance of Ford's last work. In this film, the Indians are beleaguered, harmed, and horribly mistreated people, and the U.S. officials and Cavalry are the "bad guys" and perpetrators of violence and harm. This marks a complete turnaround from Ford's earlier stance in previous films in which the Indians were the "bad guys" and the U.S. Cavalry was the liberators, riding into the scene to fight against the evil Indians and rescue the good settlers. All this is true even though the film was unsuccessful on its release and it is less than great; Ford may have been sick and tired while making it, and that may account for some of the film's flaws. Ford was one of the first directors to use John Wayne as an actor, and over 35 years John Wayne appeared in more than twenty of Ford's films, including Stagecoach (1939), She Wore a Yellow Ribbon (1949), The Quiet Man (1952), The Searchers (1956), The Wings of Eagles (1957), and The Man Who Shot Liberty Valance (1962). Ford also used Irish actress Maureen O'Hara in some of his best films. 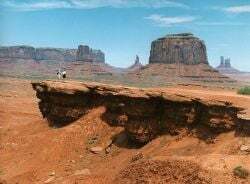 Ford's favorite location for his films was Utah's Monument Valley. In fact, Ford found in Monument Valley a perfect visual backdrop and reference for the emotional and ideational content of his films, and many people's knowledge of and appreciation for Monument Valley comes from what they have seen in Ford's movies or the movies of subsequent directors who have used Ford's Monument Valley backdrop because of the Ford influence on them. Ford defined images of the American West with some of the most beautiful and powerful cinematography ever shot, in such films as Stagecoach, The Searchers, Fort Apache, and She Wore a Yellow Ribbon. John Ford married Mary McBryde Smith, on July 3, 1920, and they had two children. Ford never divorced his wife, but had a five-year affair with Katharine Hepburn after they met during the filming of Mary of Scotland (1936). The longer revised version of Directed by John Ford shown on Turner Classic Movies in November 2006. features comments by directors Steven Spielberg, Clint Eastwood, and Martin Scorsese, who suggest that the string of classic films Ford directed 1936-1941 was due in part to his affair with Hepburn. During World War II, Commander John Ford, USNR, served in the United States Navy and made documentaries for the Navy Department. He won two more Academy Awards during this time, one for The Battle of Midway (1942), and a second for acclaimed documentary December 7th (1943). Ford was present on Omaha Beach on D-Day. As head of the photographic unit for the Office of Strategic Services, he crossed the English Channel on the USS Plunket, anchored off Omaha Beach at 0600. He observed the first wave land on the beach from the ship, landing on the beach himself later with a team of U.S. Coast Guard cameraman who filmed the battle from behind the beach obstacles, with Ford directing operations. The film was edited in London, but very little was released to the public. Ford explained in a 1964 interview that the U.S. Government was "afraid to show so many American casualties on the screen," adding that all of the D-Day film "still exists in color in storage in Anacostia near Washington, DC." Thirty years later, however, historian Stephen E. Ambrose reported that the Eisenhower Center had been unable to find the film. In 1955, Ford was tapped to direct the classic Navy comedy Mister Roberts, starring Henry Fonda, Jack Lemmon, William Powell, and James Cagney. Mervyn LeRoy replaced Ford during filming, however, when Ford suffered a ruptured gallbladder. Ford cast Ward Bond as John Dodge, a character based on Ford himself, in the 1957 movie The Wings of Eagles, again starring John Wayne and Maureen O'Hara, possibly his favorite actor and actress. On Sunday evenings the "good ol' boys club" met at the John Ford Ranch in the San Fernando Valley. John Ford and John Wayne (whom Ford used to kid about having decided not to fight in World War II), would be at the Ranch, together with Ben Johnson, Chill Wills, Ward Bond, Grant Withers, Harry Carey, Jr., Ken Curtis, Victor McLaglen, Francis Ford, and many of the other supporting actors who were usually in all of Wayne's pictures. Sometimes Lee Marvin would show up. This group was often known as "The John Ford Stock Company." Some critics have held that Ford's movies lack dialogue and that Ford was not a dialogue director. However, some of Ford's movies, especially the post-World War II ones, do have a great deal of dialogue. But it is true that Ford constructed his movies on visual symbols and stories more than on words. John Wayne—made and trained by Ford—is a perfect example of this: Wayne's presence and force in a film were based far more on visual cues than on verbal ones, even though he made famous the designation "pilgrim" in some of Ford's movies. Critical response to and assessment of Ford's work has been mixed. Ford, as well as critical response to him, have both been controversial. As Orson Welles asserted, Ford is the great Old Master of American cinema. Ford made the icons, such as Stagecoach, The Informer, The Grapes of Wrath, the westerns and cavalry pictures that created norms for subsequent films. But Ford's work also has weaknesses. He had a taste for stupid and bawdy humor, such as the drunken soldier in She Wore A Yellow Ribbon and the drunken and poker-obsessed judge and the twittering spectators in Sergeant Rutledge, and crudities of this kind tend to appear even in Ford's best films; Ford and Henry Fonda had a breakup over Fords insistence in putting such offensive stuff in Mister Roberts. Toward the end of his career, on films such as The Horse Soldiers, Cheyenne Autumn, and others, Ford seems to have become tired and have lost interest before the film was completed. His interest in working as quickly as possible and getting things on the first take meant that things were sometimes done in a careless or slipshod manner. Filmmaker and critic Lindsay Anderson found such lapses in Fort Apache, The Informer, She Wore a yellow Ribbon, and others. more than one young man … had his eyes opened to the notion that movies might be something more than an instrument for fantastic escape from childhood constraints, picked up his first hints of film's larger possibilities as an expressive form, and made his first inchoate emotional commitments to that form—commitments that led eventually to professional engagements with the movies—because of John Ford's pictures (Quoted in Eby, 128). But Schickel then went on to deconstruct Ford's oeuvre and find it wanting. Antiwar people and political leftists dislike Ford's commitment to and positive depiction of the military and military virtues such as honor, discipline, valor, and courage, as shown in They Were Expendable and the cavalry pictures, as well as others. Feminists dislike Ford's depiction of women. The women in Ford's pictures are not weak or femmes, they are often quite strong and determined, but these strengths are invariably expressed in terms of their relationships with their children (especially their sons), their husbands, and their lovers—they do not have an independent existence apart form those relationships. A possible exception to that occurred in Wings of Eagles, in which the John Wayne-Maureen O'Hara relationship is handled subtly; after the woman endures a neurotic breakdown, she does begin to have an independent life, only to go back to her husband when he goes to get her back. Other critics have given more appreciative assessments of Ford's work. Lindsay Anderson saw him as a split personality, emphasizing simplicity and realism at some times (for example, The Quiet Man, They Were Expendable), but using a deliberately stylized and expressionist style in others (The Informer, The Fugitive, The Long Voyage Home). There is the problem that many and perhaps most or even all of Ford's pictures are somewhat quaint today, with a highly dated feel and sensibility to them. The visual sense, framing, presentation of cinema space, blocking, and movement of actors in that space are still as masterful as ever. But the overall tone of the picture is often dated. Ford himself rarely, if ever, spoke about aesthetics and his aesthetic interests or what he was attempting to convey, apparently regarding such questions and discussions as useless. He did come from a tradition of Irish storytelling genius, and he knew how to tell those stories visually. His mastery of visual storytelling was and remains one of the best ever expressed in cinema anywhere and at any time. He was able to evoke a rich subtext without calling attention to it; there are no circles and arrows in Ford's pictures to make sure that the audience does not miss what he wants themu to see. He does it all subtly and naturally. Despite his association with conservative actors John Wayne, James Stewart, and Ward Bond, as well as a pro-military and pro-order and government sensibility that some have gone so far as to call fascist, Time Magazine editor Whittaker Chambers wrote a harsh review of Ford's The Grapes of Wrath, claiming it was left-wing propaganda. "My name's John Ford. I make Westerns. I don't think there's anyone in this room who knows more about what the American public wants than Cecil B. DeMille—and he certainly knows how to give it to them. But I don't like you, C.B., and I don't like what you've been saying here tonight." Ford died in Palm Desert, California, aged 79, from stomach cancer. He was interred in the Holy Cross Cemetery in Culver City, California. A statue of Ford in Portland, Maine, depicts him sitting in a director's chair. Ford won four Academy Awards as Best Director: for The Informer (1935), The Grapes of Wrath (1940), How Green Was My Valley (1941), and The Quiet Man (1952)—none of them Westerns==(also starring in the last two was Maureen O'Hara, "his favorite actress"). He was also nominated as Best Director for Stagecoach (1939). Ford is the only director to have won four Best Director Academy Awards: Both William Wyler and Frank Capra won the award three times. As a producer, he received nominations for Best Picture for The Quiet Man and The Long Voyage Home. He was the first recipient of the American Film Institute's AFI Life Achievement Award in 1973. John Ford made more than two hundred films during his career—so many that it is impossible even to list all of them. Some of them are now lost. As Jack Ford: All films were made by Universal Studios unless otherwise noted. Eby, Lloyd. "John Ford: The American Old Master." The World & I, 10:2 (Feb. 1995), 124-129. All links retrieved May 6, 2018. This page was last modified on 16 May 2018, at 16:06.